Low inductance DC link capacitors for IGBT inverters, DC link capacitors for GTO inverters and choppers; surge and spike suppression. API Capacitors design and manufacture DC capacitors that are not limited to a catalogue range. Current, voltage, size, mass and terminations are matched to the customer’s requirement and application, a few of which are listed below. Long life and high reliability is achieved using ultra low defect density, high isotactic, metallised polypropylene dielectric film incorporating an extended working temperature range and controlled self-healing capability. Elements are wound on the latest precision edge controlled automatic winding machines. High conductivity copper is used for low resistance internal connections. 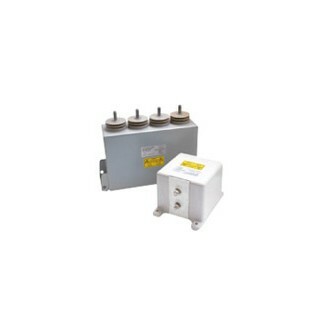 Capacitors are finished in powder coated corrosion free metal or insulated cases and filled with an environmentally safe oil or dry leak free resin. Used in Transportation, Marine, Automotive, Aerospace, Military, Medical, Renewable Energy, Power Distribution sectors and other industrial applications. Designed to meet detailed or brief specifications. Our technical sales representatives can work closely with your design team at concept stage or at the later stages of a project when a time critical design is needed. Alternatively like for-like replacements for older retro-fit designs can be offered.